This premier heavy weight kilt is expertly made by hand, using a minimum of 8 yards heavy weight 16 oz 100% pure new Scottish-woven worsted wool. This superior kilt is available in over six hundred patterns, from the bright bold modern colours, to lighter ancient tones and the beautiful muted hues of the weathered tartans. Our kilts are handmade by our own kilt makers, using skills passed down through the generations. The work that goes into one of our hand-stitched kilts takes many hours but the process does create the finest kilt. This hard wearing premier heavy weight kilt will look fantastic, fit well, and when treated with care, will last you a lifetime. 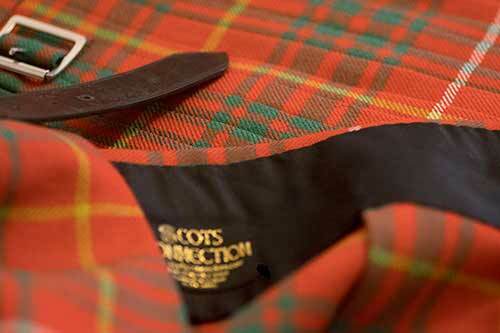 Read about the making of our kilts. We supply non-fraying tartan flashes and garters worth £29.99 free with every kilt we sell. • Free UK and International shipping available on every kilt! • Our kilts are hand-made to order. • Allow 4-5 weeks in addition to shipping times. • Surcharges: Seat sizes of 44 inches and above will cost an additional £35.50 for the extra material. • On ordering your kilt we email you our home measurement form. The superb quality and craftsmanship of this product is without equal. It's not just a piece of truly Scottish-made clothing, but a wearable work of art. The attention to detail of my Bruce Ancient kilt, along with swift and courteous customer service, makes this one of the best foreign purchases I've ever made. It was also completed and arrived in under half the time that two American-based kilt makers had quoted. The flashes are an extra bonus not included by most kilt makers, so that was a welcome addition. I had an opportunity to compare my kilt against two kilts worn by friends -- one made in Scotland and the other in USA. Without a doubt, the Scots Connection premier hand-stitched, heavy weight kilt was superior in every instance. Those who can afford the additional cost will certainly appreciate the value of having a garment that will last a lifetime -- if not longer. The Kerr kilt is truly outstanding! I was approached in London at the last big celebration for the Queens birthday by a party from Canada, Kerr's to a man (and woman!) they wanted a group and then individual photos, so my clan has brought me a bit of North American fame. My kilt arrived this week, and it's gorgeous. Fits like it was made for me, Perfect! The belt buckle is also stunning. They will be worn with pride! Thanks very much for your outstanding customer service. I ordered my kilt in MacDuff modern and I couldn't be more pleased with the result.The fit is perfect and the materials used really are first class. I especially like the sturdy leather straps. The pleating is immaculate and the hang and swing of the kilt is something to behold. I can fully recommend Scots Connection and wont hesitate to buy from them again. Thank you so much for the kilt. It arrived earlier than expected and it feels and looks awesome. What a great job you guys did! I just received the handmade kilt for my brother. It is absolutely exquisite. I can not thank you enough for ensuring it arrived in time for Christmas! Merry Christmas to all of you whose hand labor of love made my brothers kilt. My new kilt arrived today and I am absolutely delighted with it. Fit is perfect, and the quality and craftsmanship is superb! My kilt arrived this morning, it is a perfect fit and looks great. Thank you for your help. Thanks for all your help, prompt responses and delivery, the kilt has arrived safely and fits perfectly. I have just taken delivery of my kilt etc. and am absolutely delighted with it. Went for the Modern Douglas tartan and it is very impressive. Kilt and jacket fit perfectly - the home measuring guide was really easy to follow. Like many others out there I was a bit apprehensive about ordering online, but the service and quality of the items from Scots Connection was 100% faultless. I would recommend you to anyone out there who is thinking of buying themselves the highland regalia. I had some apprehension about buying online, however my fears were allayed when the kilt arrived. The fit is perfect, and my wife, who trained as a dressmaker, confirmed the fine quality of the pleating and stitch work. Overall I am very happy with the kilt and the service received from Scotts Connection.